The past couple of years has been very important in terms of innovations in the world of technology. The app development sector, in particular, is heading towards a huge transformation due to various trends. These trends are already dictating app development at present and will continue to do so in this year and the coming years. There is a growing demand of smart mobile devices worldwide. This has fueled demand of Android developers with innovative ideas. With this increasing demand of Android developers, recruiters are struggling to find job-fit candidates. They are falling short of resources such as right assessment tool as well as interview questions that needed to be asked to evaluate technical skills of candidate. Are you also hiring for Android developers and stuck up with how to assess the knowledge of candidate while interviewing? This guide will help you to know which skills to assess and interview questions that you can ask to Android developer. 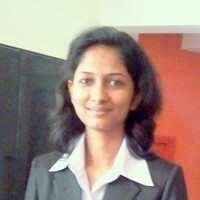 These interview questions throws light on candidate’s attitude towards Android programming. Let’s first see which Android developer skill set you must assess to hire an Android developer. An Android developer must possess few basic skills which you can expect from entry level as well as lateral hire. I have listed some crucial Android skills you can assess before you invite a candidate for the interview. These skills can be assessed by using recruitment assessment tool like Interview Mocha. One of the best easy to use platform which is used by 100+ IT recruiters worldwide. You can choose from library of 500+ IT skills tests to assess latest technology skills. This will help you to speed up your hiring process and save hiring time up to 50%. Tech hiring managers can fill up Android developer positions in no time for their respective projects. Hiring managers can use powerful reporting tool which highlights total score analysis and section wise score to take data driven hiring decisions. Android Online Test: This test will help you to evaluate skills like Thread Concepts, Components, Class/Object Subclass, Life Cycle, and Activity Life Cycle. Use this test for entry level candidate assessment. 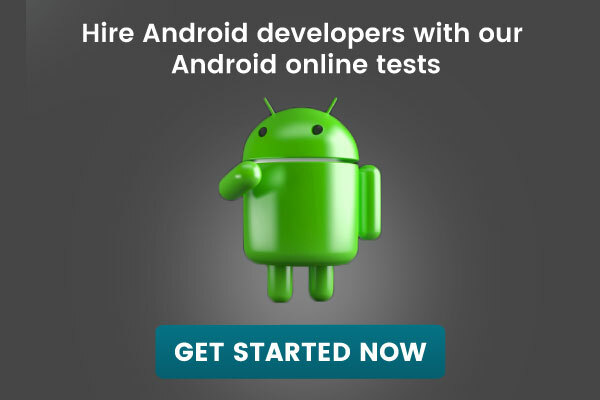 Android Developer Test: Quantify candidate’s knowledge on Network Operations, Classes & Subclasses, Application Components, Life Cycle Process, Manifest file & its Elements. Use this test for lateral hiring. Android Subjective Test: Assess skills like JSON Parsing, Building Media Browser, Connecting Bluetooth, Proximity Sensor, ProgressDialog class, SQLite DataBase and more. 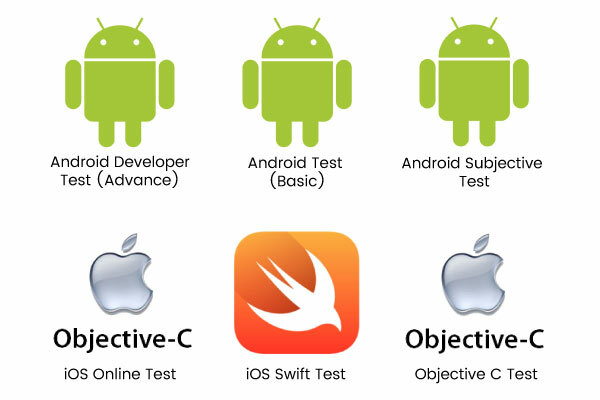 Online Mobile Tests: Use our 10+ skills tests to assess other app development skills like iOS app development, Android app development and mobile app testing. If you want to add more questions, you can ask us to customize test questions to suit your requirement. After the assessment process, you will be left with only quality candidates whose skill set match with your job description. Once you select relevant candidates on the basis of scores in above assessment tests, you can invite them for the interview process. Below list of Android topics for interview covers fundamental concepts of Android app development to understand the depth of knowledge candidate possesses. Ask interview questions on below topics. 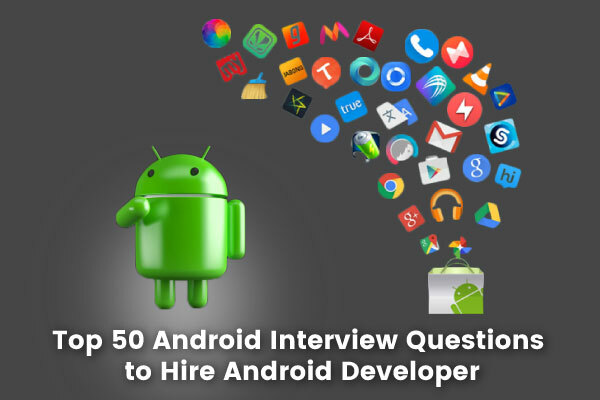 Here is the compilation of few Android interview questions. The complexity of questions may differ as per the experience level. What are the life cycle methods of broadcast receiver? How do you kill a fragment? How do you store multiple user credentials using preferences? How do you pass data from one screen to other screen? What is dx file and how it is generated? How many ways we can store data in android? What all the different data storage options available in android? Why cannot you run standard Java Bytecode on Android? How can two Android applications share same Linux user ID and share same VM? How can your application perform actions that are provided by other application e.g. sending email? How do you supply construction arguments into a Fragment? How would you create a multi-threaded Android app without using the Thread class? How would you access data in a ContentProvider? When might you use a FrameLayout? How to create a new Android project within android IDE? How to add any fragment without using user interface? How will you set Orientation in Android IDE? What is renderscript? When would you use it? How does the OutOfMemory happens? If you have a fragment which displays a ListViewContaining query results, which API would you use to bring the data over to the device asynchronously? What is the key used to bundle an extra parameter on a PendingIntent holding a location? What permission is required for your application to use the device's vibrate hardware? How to enable overlay mode On API level 11 or higher, to create a custom theme for your activity. Which manifest "uses-configuration" should your application use if your application requires a finger activated touch screen on the device? What are the main components/building blocks of Android? Which database is used for Android? Can Android application only be programmed in Java? What is the difference between an implicit intent and explicit intent? Where can you define the icon for your Activity? When does ANR occur and how can ANR be prevented? What is AIDL and explain data types are supported by AIDL? Is there a case wherein other qualifiers in multiple resources take precedence over locale? What are the different states wherein a process is based? Mention 5 Native Android Actions? What items are important in every Android project? Explain the ways by which data is stored in Android? Explain layers in Android Architecture? Can you explain concepts like Adapter, Service, Activity and adb? How do you request permissions for your application? How do you display Action Bar back button on all versions of Android? What are Dalvik Executable files? Which service is used to perform IPC, when bind application to a service? What are the main components of Android application? These interview questions will help you to scrutinize technical skills of the Android developer. It will be difficult for recruiters to evaluate candidate skills just by looking at candidate resume. It may happen that a candidate has given a wonderful interview and failed to perform after hiring. This increases costs of bad hiring. To avoid these bottlenecks you must use pre-employment assessment tests which helps to filter only job-fit candidates for the interview. If you want to know more about the process of hiring an Android developer, you can refer our blog on how to evaluate and hire an Android developer. Do you have any interview question that we missed? Let us know in comments below.